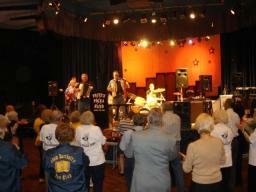 As FPB tears through their final tune of their morning set on November 3, 2007 at Adam Barthalt's Polka Weekend, a mass of people approach the stage and cheer on FPB! 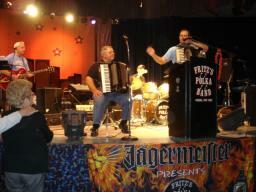 Fritz is pictured here introducing the members of FPB to the big crowd on November 3rd, prior to FPB's final tune of the morning in Monticello, NY. 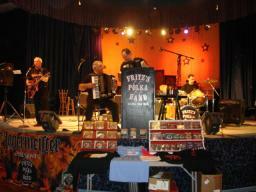 Fritz stretches out the button-box accordion while Rick drums along during FPB's morning set on November 3rd at Adam Barthalt's Polka Weekend in Monticello, NY. 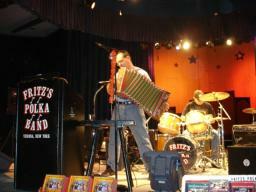 FPB rips through a tune during their afternoon performance of November 2, 2007 in Monticello, NY. 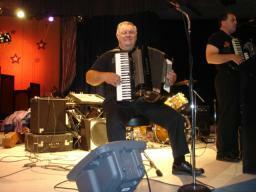 Fred with his Excelsior on November 2nd at Adam Barthalt's Polka Weekend. 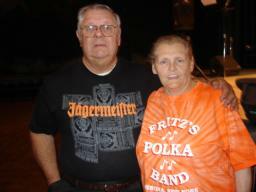 Fred poses here with one of the many Fritz's Polka Band fans that watched FPB's afternoon performance on November 2, 2007 in Monticello, NY.